When and Where was Charlotte Bronte Born? 21st April 1816, The Vicarage, 74 Market Street, Thornton, Yorkshire, England. Charlotte was the daughter of a Cleric, Patrick Bronte and sister to Branwell, Emily and Anne Bronte. Clergy Daughter’s School, Cowan Bridge. Miss Wooler’s School, Roe Head. 1816: Father appointed perpetual curate at Haworth. 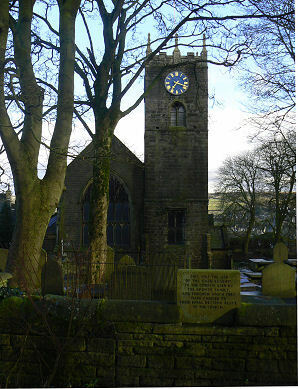 1820: Anne was baptised in the “Old Bell Chapel” at Thornton on 25th March. 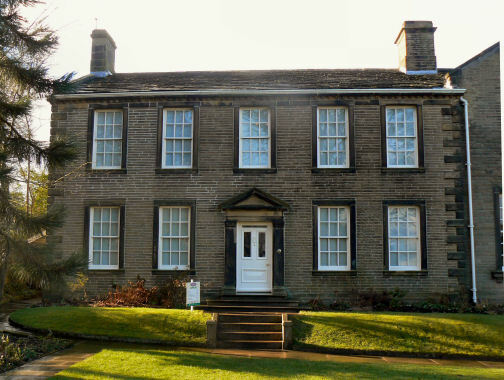 In April the Bronte family move to the Parsonage at Haworth. 1821: Death of her mother on 15th September. 1825: Death of her sisters Maria (aged 11) on 6th May and Elizabeth (aged 10) on 15th June from consumption. 1829: Charlotte Bronte takes up writing about her fantasy world of Glasstown and Angria. All the Bronte children receive art lessons from John Bradley of Keighley. 1832: She returns home to help tutor her sisters. 1835: Charlotte goes back to Roe Head School as a teacher. 1838: She returns to Haworth after handing in her resignation. 1842: Charlotte goes to Brussels with Emily in February to study at the Pension at Heger. Death of her Aunt Elizabeth in November and they return home. 1843: She returns to Brussels to teach English and to further studies. 1844: Charlotte returns home and tries to open a school in Haworth but there are no takers for such an isolated spot. 1845: Branwell suggests to his sisters that novel writing is a profitable business. 1846: “Poems by Currer, Ellis and Acton Bell” (The sister’s pseudonyms) published in May with the family paying the costs. Offers “The Professor” for publication without success. In August she begins writing “Jane Eyre”. 1847: “Jane Eyre” is published in October and is highly acclaimed. “Wuthering Heights” by Emily and “Agnes Grey” by Anne are both published in December. 1848: “The Tenant of Wildfell Hall” by Anne is published in June. Death of brother Branwell from consumption on 24th September. Death of sister Emily from consumption on 19th December. 1849: Anne is examined at Haworth by Doctor Teale in January and found to have consumption. (May 25th) Charlotte goes with Anne and her friend Ellen Nussey on 26th May to Scarborough. The next day Anne goes swimming alone but collapses. In the afternoon she drives herself on South Sands in a donkey cart. Charlotte discusses with Anne about returning to Haworth on 27th May but it is too late. Anne dies on 28th May from Consumption. Publication of “Shirley” during October. 1852: Charlotte visits Anne’s grave and realises there are several mistakes on the tombstone which she has corrected. 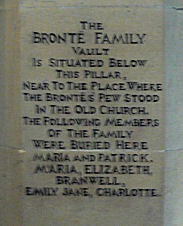 (1893): The Bronte Society is Established. 1846: Poems by Currer, Ellis and Acton Bell. 1847: “The Professor (Published 1857). “Jane Eyre”. (1933): “The Legends of Angria”. (1971): “Five Novellettes” A collection of Juvenilia. 29th June 1854: To Arthur Bell Nicholls, her father’s curate despite objections from her father. 31st March 1855, Haworth, Yorkshire, England, in the early stages of pregnancy of excessive vomiting. St. Michael and All Angels Church, Haworth, Yorkshire, England. Oakwell Hall country park, batley area visited in Shirley. Red House Museum, Gomersal. (Former home of her friend Mary Taylor). Norton Conyers, Ripon. (is Thornfield Hall mentioned in “Jane Eyre”). Red House Museum, Gomersal. (House of her friend Mary Taylor).